Susan's Disney Family: Check out the fun playset from Just Play Toys, Minnie’s Happy Helpers Pet Carrier! Check out the fun playset from Just Play Toys, Minnie’s Happy Helpers Pet Carrier! 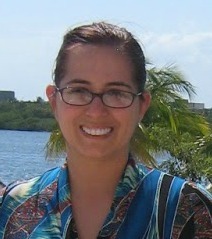 Summer time is here in full force, the kids are home and are reader for some fun! I have a super fun toy to introduce you all to from Just Play toys. 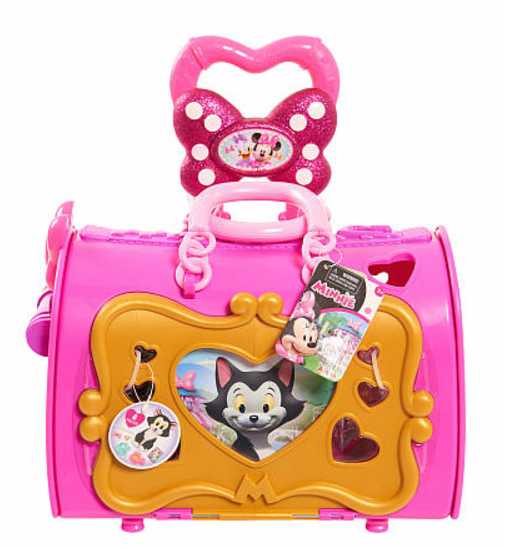 The adorable Minnie’s Happy Helpers Pet Carrier will make your preschooler/kindergartener squeal with delight. Kids love accessories and new friends to have fun with, and this cool new toy has all of that! Cute pink carrier that comes with plush kitty Figaro. Carrier has wheels and extendable handle for on-the-go play. Kitty collar with charms can also be worn as a bracelet! Carrier opens from both the front and side. 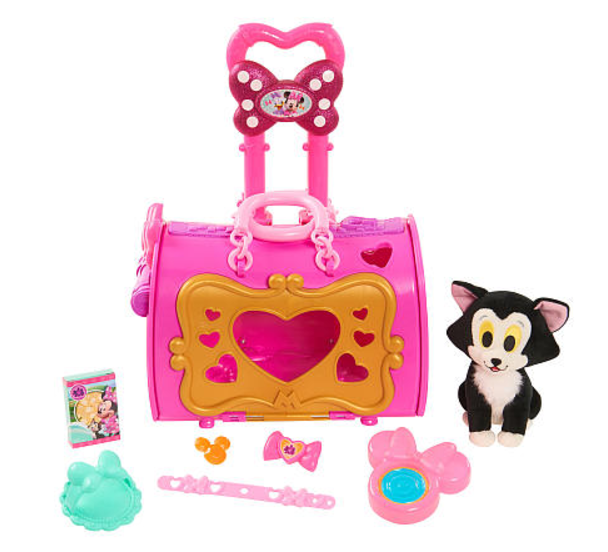 Comes with plush kitty Figaro and six accessories including 2-in-1 food and water bowl, pet brush, a play treat box, and a kitty collar with 2 pop in charms. My daughter just loved Minnie Mouse when she was growing up she just loved the pink and the girly Minnie dolls and accessories. My daughter had so many Minnie items, bendable dolls, stuffed critters, Minnie clothing you name it she had it (or wanted it). 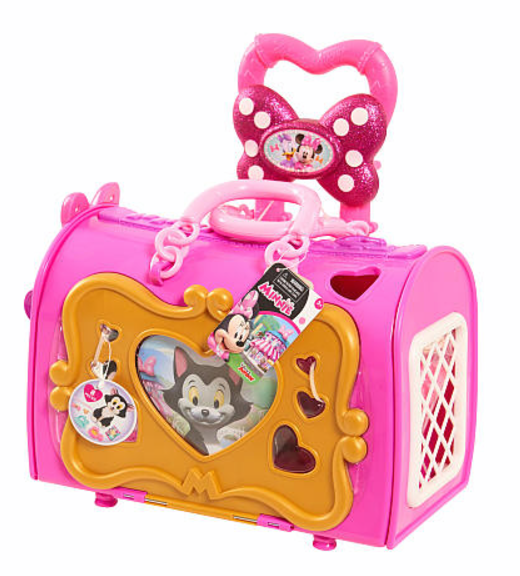 One item my daughter would just flip for is this awesome new playset for the little Minnie fans out there, the Minnie’s Happy Helpers Pet Carrier is filled with all you need to let your imagination soar. Who here grew up a fan of Minnie, and of animals? This new toy has both of things kids love all wrapped up into one portable toy. This tote able set, can easily be pulled around the house and dragged along for travel. The set is filled with just what you need to care for that stuffed friend in need. I love that there is a suitcase like handle on the travel kit, it makes your little one feel all grown up and ready to start their own grooming business. They have all they need to keep all of their furry friends happy including a 2-in-1 food and water bowl, pet brush, a play treat box, and a kitty collar with pop in charms that you can also wear as a bracelet. Fashion for you and for kitty, I love it! This set is recommended for ages 3 years and up. And the cost is about $24.99 -$29.99 so it is pretty affordable for all that comes with the set. 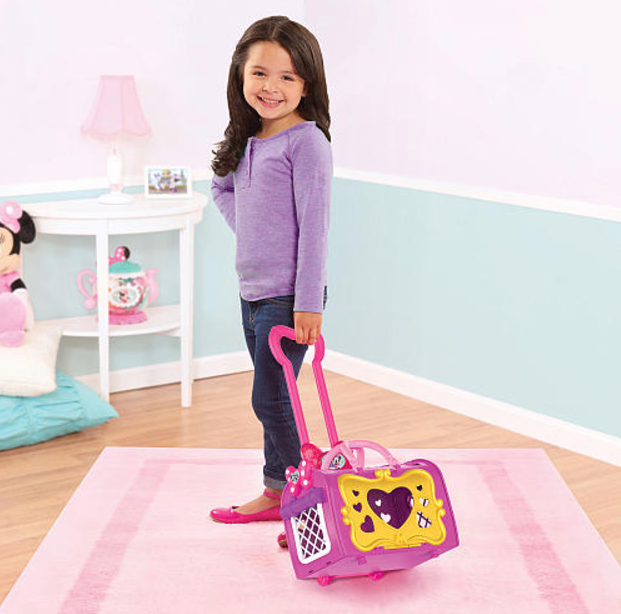 Do you have a little one that would love a cool play set like the Minnie’s Happy Helpers Pet Carrier? The generous folks at Just Play are giving one of Susan’s Disney Family readers a chance to win their very own Minnie’s Happy Helpers Pet Carrier. Would you like to enter? Please let me know who would love to play with this toy and why? There are also other ways to enter, please enter below. Be sure to stay social with Just Play for info and announcements for other great toys! You can purchase the Minnie’s Happy Helpers Pet Carrier online and in stores now visit Just Play to see where to purchase. One winner will win a Minnie’s Happy Helpers Pet Carrier $29.99 value. Even though my daughter is 6, she would still love this because she loves cats, and wants to be a vet when she grows up. I could see her playing vet with this, for sure! My daughter would love this! She loves Minnie! My daughter would love to! She loves cats but I'm allergic ! My niece will love this. She loves Minnie Mouse! My toddler would love it, he can put his stuffed toys in them and carry them around. My granddaughter would love this. She loves anything Disney but especially Minnie! I know my granddaughter would love to play with this because she loves to love and take care of all animals! My granddaughter would love this. She has a big heart for animals and loves to play pretend. My 3 year old daughter would absolutely love this! She loves Minnie and Figaro. She also loves to play doctor or vet to all of her friends! New patients would be an awesome addition. My niece would love to play with this! She loves animals and is obsessed with Mickey and Minnie! My daughter would love to play with this. She loves Minnie's cat Figaro on the show. I'd love to win this for my daughter, she loves Minnie mouse and she also loves animals! Perfect combination. My youngest would love to play with this, she loves Minnie. Thanks! My great niece, Effie, would love to have this! Sweet giveaway! My twins would love this, it's so cute. My youngest would love this because she loves Minnie Mouse! My daughter would love to have this to play with!